Maybe your fondest dream has always been enjoying your own private villa, somewhere with an exceptional climate all year around, near all Disney and Universal Studios Parks. Enjoying your favorite pastimes, for example, on the golf course you overlook from your pool or on any of the many championship golf courses in the area. Having all amenities close on hand: bars and restaurants, commercial centres, car rental and international airports. Going to cultural and social events. This villa exists. Come and see it for yourself. Welcome to Casa del Sol in Orlando, Florida. Luxury 5 bedroom villa situated along the exclusive Highlands Reserve Golf Club. A 1-minute walk from this villa and you will find yourself in the recreation area with an Olympic Size Pool, a 2-minute walk to the Golf Clubhouse, and Disney World is only a 10-minute drive away. 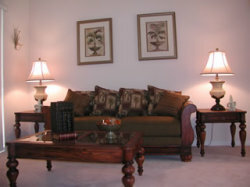 This villa was professionally furnished to very high standards and comprises: Family Room, Kitchen with Breakfast Nook, Dining Room, Formal Living Room, Utility Room, Floridian Foyer, 2 Master Bedrooms with en-suite Bathrooms and King Size Beds, 1 Queen size Bedroom, 2 Double Bedrooms, 1 common bathroom, and Swimming Pool with Jacuzzi. This villa has full air conditioning and heating. Up to 12 people can be accommodated and all linen, towels and running costs (including pool heating) are included. A telephone line is provided with free local calls. Family Room is equipped with a High Definition Television and a 5.1 Dolby Digital Surround Sound Home Entertainment System. 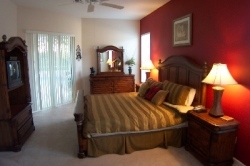 Master Bedrooms are equipped with TV/DVD/VCR/CD Combo Entertainment Systems. The pool deck contains a 36ft. 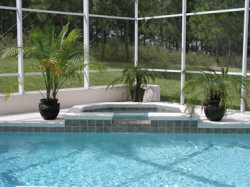 Heated Pool and has a Jacuzzi and screens. 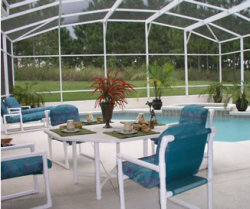 The pool area is surrounded by an oversized Lanai with Cushioned Loungers and an outdoor Dining Set. This is a fully managed property with the Management Company offices just 5 minutes away. Balance to be paid - 12 Weeks prior to Ch to arrival.